Falling behind on debt is unsettling for any person or family. No one wants unpaid bills piling up, but circumstances sometimes make it impossible for hard-working people to get ahead. The end result often leads to the embarrassment caused by harassing phone calls from creditors, car repossessions, garnishment of wages, home foreclosures, and even lawsuits. Fortunately, the law recognizes that honest people often get caught in the quicksand of debt, and filing for bankruptcy offers hope for future financial stability. If you are struggling financially and are looking for quality legal advice, you have found the right bankruptcy law firm and the right website to learn your rights. Debt problems come in many forms. For some people, unforeseen circumstances, such as divorce, illness, injury or job loss have caused extreme financial stress. For others, debt problems may be the result of overspending and poor financial choices. No matter what the reason, help is available through the law offices of David M. Siegel. If you are overwhelmed with unsecured debt such as credit cards, medical bills, personal loan and utility bills, then Chapter 7 bankruptcy is usually the best option to change your financial picture. There are certain asset and income limitations and not every type of debt is eliminated through Chapter 7. However, for the majority of individuals who earn less than the Illinois median and have minimal assets, Chapter 7 provides the most relief. If on the other hand you are someone with significant non-exempt assets and have the ability to repay either all or a portion of your debt over time, then Chapter 13 is the best choice to reorganize your debt. The most common use of Chapter 13 is to save a home that is in foreclosure. You are able to repay the mortgage arrears over a three to five year period while being allowed to make your current mortgage payment once again. Chapter 13 will stop a foreclosure, provided there has not been a prior sheriff sale or auction date and will force the mortgage company to accept current payments once again. In 99% of all situations, there is a solution and a way to financial relief through bankruptcy. The attorney or law firm that you hire is the most important decision that your face. The right attorney can advise you as to what Chapter is best and can guide you through the process from start to finish. The law firm of David M. Siegel has been helping individuals and families gain control of their debt with sound advice, a caring heart and a compassionate soul. 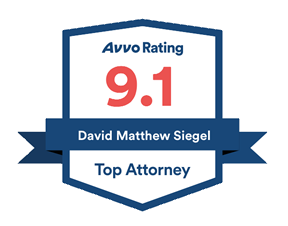 David M. Siegel is an attorney and owner of David M. Siegel & Associates, a law firm handling Chapter 7 and Chapter 13 bankruptcy cases throughout Chicago and its suburbs. Office locations include Chicago Loop, Chicago South, Wheeling, Waukegan, Joliet, Aurora and Westchester. He is the author of “Chapter 7 Success: The Complete Guide to Surviving Personal Bankruptcy.” He is a member in good standing of the bar of the State of Illinois and current member of the American Bankruptcy Institute. Practicing since 1991, he has counseled well over ten thousand individuals with respect to Chapter 7 and Chapter 13. He graduated from the University of Illinois in 1988 and received a Bachelor of Science degree in Political Science. He earned his Juris Doctor degree from the John Marshall Law School in 1991. He was admitted to the General Bar of the United States District Court for the Northern District of Illinois in 1991, the Central District of Illinois in 2008 and the Southern District of Illinois in 2010. Additionally, he was admitted to practice before the United States Tax Court in 2006. He is a former member of the American Bankruptcy Institute and former member of the National Association of Consumer Bankruptcy Attorneys. He has appeared on Fox News Chicago and has been featured in the Chicago Tribune, the Daily Herald, Time Magazine and U.S. News & World Report. Ultimately, deciding whether or not to declare bankruptcy is up to you. Still, it is important to make an educated decision regarding bankruptcy, which is where our Chicago based team of attorneys can help. Sometimes there is no other choice other than to declare bankruptcy, but understanding bankruptcy law will help you draw a clear path toward your future. First and foremost, the Law Offices of David M. Siegel will work with you on an individual basis. Our team of Chicago bankruptcy attorneys will review your finances and make sure you understand every step of the bankruptcy process. We believe that bankruptcy is not an end, but rather a beginning. It is a chance for a new start and a good night’s sleep. It can mean that someday you will be able to buy your dream home, or the car you’ve always wanted. Filing bankruptcy is an opportunity for many Chicago folks who simply want to get back on track after being derailed by a hospital stay, being laid off, or other event that is simply beyond anyone’s control. Many of our bankruptcy clients are also surprised to learn that filing for bankruptcy is far less expensive than expected. During your initial consultation with one of our Chicago bankruptcy lawyers, we will outline the costs that you will incur if you decide to file for bankruptcy. We recognize that most people seeking to declare bankruptcy are looking for an affordable Chicago attorney, and we seek to meet those expectations. Whatever you decide, it is vital that you speak with a qualified Chicago attorney, dedicated to bankruptcy law. Because our primary focus is bankruptcy law, we are equipped to take the guesswork out of the process and can provide honest answers and clear focus. We will be your advocates throughout the bankruptcy process, and will aggressively fight for your legal rights.